Welcome to the March 2016 issue of our occasional newsletters. 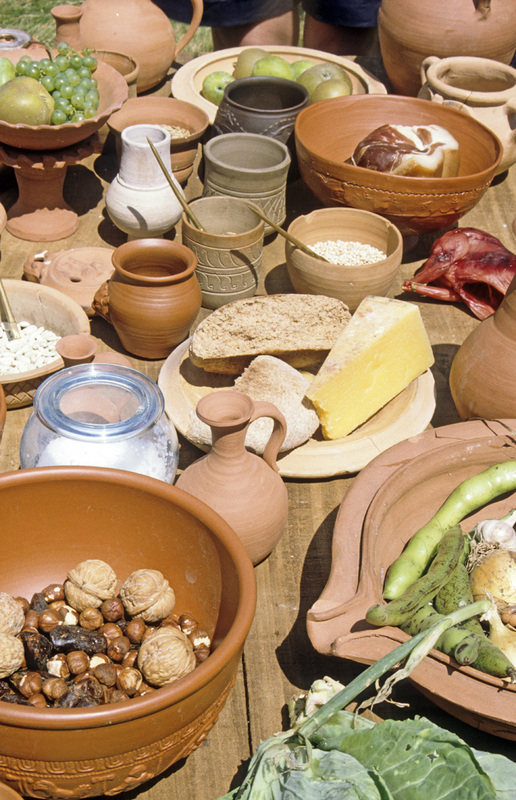 The Romans liked to eat well, and some of their choices of food are still regarded as wholesome today, particularly the staples of bread, olives and wine. They also had a liking for pungent fish sauces such as liquamen, muria and – the best-known one – garum. The production of these sauces was a by-product of the fish-processing industry, mainly in Roman settlements along the Atlantic coasts of Spain, Portugal and north Africa, where there was an abundant supply of fish. Fish sauce, especially garum, was so popular that it was exported across the Roman empire as an expensive delicacy. Doubtless in far-flung garrisons on the edges of the empire, many ex-patriot Romans found garum a welcome reminder of home comforts back in Italy. Garum was produced on an industrial scale in purpose-built factories. 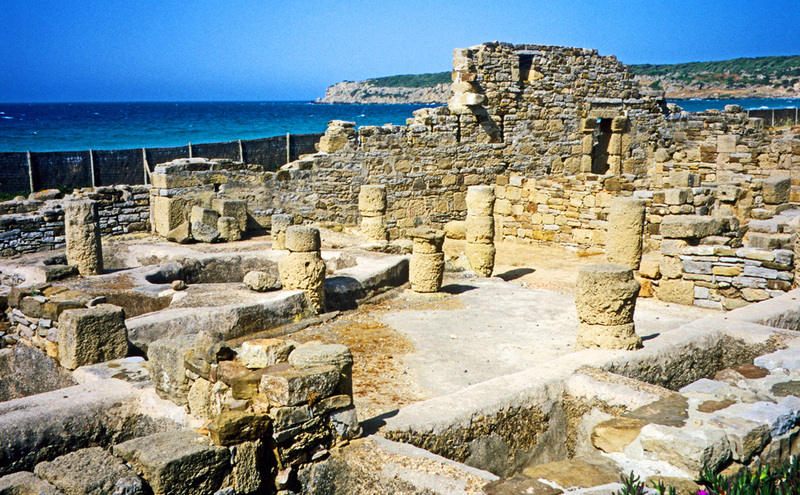 One factory was at the Roman town of Baelo Claudia on the coast of southern Spain. The modern village is called Bolonia and is not far from Tarifa, in the region known as Andalusia. Baelo Claudia functioned as a port, trading with north Africa, and fishing, fish processing and the production of garum were also important for the local economy. Archaeological excavations have revealed the remains of an extensive settlement, and many of these ruins, some partially restored, are open to the public. To say that garum was a by-product of the fish-processing industry is to ignore the gory details. It was the waste parts of fish, particularly the entrails, but also the heads, tails and other scraps that were used. The actual recipe varied according to the type of fish. Sometimes all the scraps were boiled together, but usually no cooking took place. Instead, the raw ingredients were put in a huge container or tank with salt and left to ferment for several months in the very hot climate. When fermentation was complete, the result was strained and the liquid was packaged for export. Like many food items in ancient times, garum was transported in large, thick-walled pottery vessels called in Latin ‘amphorae’ (singular, ‘amphora’). Amphorae shaped like the one shown in this mosaic were commonly used. 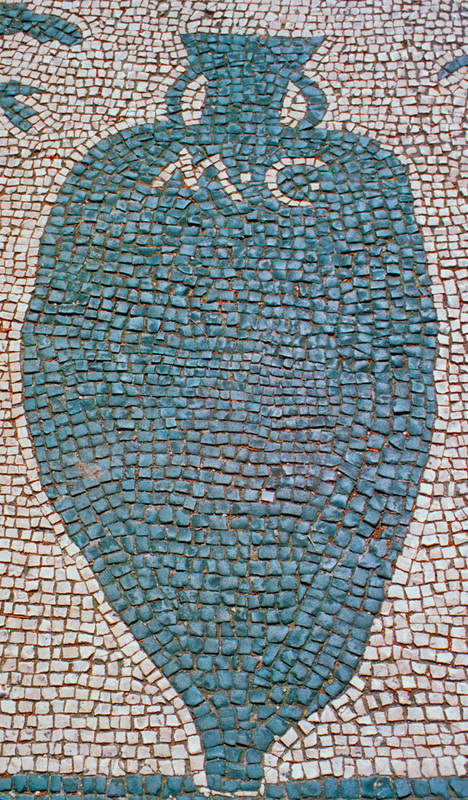 This mosaic was part of the floor of a shop or office in the ‘Square of Guilds’ in the Roman port of Ostia, near Rome. There are two palm trees on either side of the amphora, which probably advertised that the business imported dates from Mauretania Caesariensis (abbreviated as ‘M.C.’). This Roman province on the north African coast, roughly equivalent to part of modern-day Algeria, also produced garum for which the same type of amphorae were used. Ships and boats loaded with amphorae full of garum sailed from the coasts of southern Spain and north Africa to other ports in the Mediterranean, and some may even have ventured into the Atlantic to sell their cargo in Britain. The best-quality garum was expensive and seems to have been valued for its powerful flavour. It was added to all kinds of dishes and probably helped to disguise ingredients that were past their best, especially meat. While masking one evil, it may well have spread another. Recent research on the hygiene of Roman Britain has produced some unexpected results. The hot baths introduced into Britain by the Romans appear to have facilitated the increase of intestinal parasites such as whipworm, roundworm and those causing illnesses such as dysentery. Parasite eggs were spread in communal baths where the water was not changed very often. A study of human burials, latrines and fossilised excrement by Dr Piers Mitchell of Cambridge University also found evidence of an increasing spread of fish tapeworm infestations, and it seems likely that this was due to the universal consumption of fish sauces like garum. Cooking the ingredients would have killed off the parasites, but fermenting raw ingredients allowed the parasite eggs to survive in the fish sauce. The problem may well have been compounded by the practice of spreading human excrement on fields as a fertiliser. Dr Mitchell concludes that although Roman sanitation may have done nothing to improve health, at least people smelled better. The stretch of water between the Atlantic and the Mediterranean is known as the Strait of Gibraltar, separating Spain and Gibraltar from north Africa (Morocco). The southernmost tip of Spain (and of Europe itself) is at the town of Tarifa, and here the African coast is only 10 miles (16 km) away. Gibraltar lies some 15 miles (24 km) north-east of Tarifa, and the African coast is almost 14 miles (22 km) away. Even though the distance to Africa is greater here, the promontories of Calpe (Gibraltar) and Abyla (Ceuta in Africa) were significant in Greek and Roman mythology, as they were believed to be the mythical ‘Pillars of Hercules’. This picture shows the Strait of Gibraltar, looking westwards. The African coast with the promontory of Ceuta is on the left. Next comes the seaway of the Strait of Gibraltar that opens into the Atlantic. The right-hand half of the picture portrays the coast of Spain, with the distinctive darker outline of the Rock of Gibraltar in front. The myth of the Pillars of Hercules originated with the ancient Greeks and was adopted by the Romans. In one version, Africa was joined to Europe, and the god Hercules cut the channel to divide them. In another version, Hercules pulled the two continents together to narrow the channel and stop the Atlantic sea monsters from bursting into the Mediterranean. In both stories, Hercules set up the ‘pillars’ of Ceuta and Gibraltar as markers of how far he had travelled. For the people living around the shores of the Mediterranean, the Pillars of Hercules marked the limit of civilisation. Beyond lay the ‘Ocean’, which was thought to be a river encircling the earth, with any islands in it inhabited by barbarians. All but the most intrepid of sailors would have been deterred from venturing westwards by the dangers of the unknown beyond the Pillars and the real dangers from the difficult tides and currents through the Strait, where the Mediterranean and Atlantic meet. One of the Pillars of Hercules, the Rock of Gibraltar, is a natural fortress that has changed hands several times over the centuries. It was captured by the British in 1704 and ceded to Britain in perpetuity in 1713 by the Treaty of Utrecht. After that date, there were various attempts by the Spanish to regain the Rock, by direct assault or by siege, with no success. When France joined the American side in the American War of Independence, Spain saw another chance to regain the Rock and in 1779 declared war on Britain. 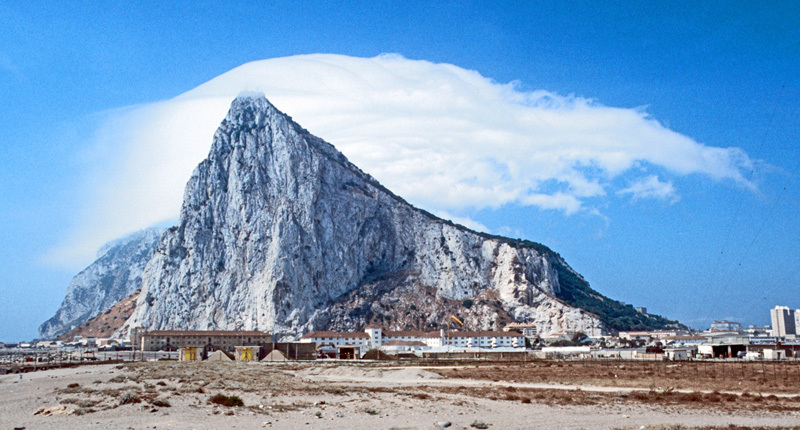 From June 1779 until March 1783 Gibraltar was besieged, but the Rock withstood all attempts to starve it into submission or capture it by direct assault. We referred to this siege in our piece about the invention of the downwards-firing depression gun in newsletter 22 for March 2011. We are now writing a book about this siege, which we are pleased to say will be published in Britain by Little, Brown and in north America by Viking Penguin – the same publishers of our Jane Austen book. We should perhaps add that Jane Austen was 3½ years old when the siege began – it would have been the talk of her family when reading aloud their newspapers. We will keep you posted on progress in subsequent newsletters. In our last newsletter, we had a competition ending on St Valentine’s Day that asked for the surname of the character Emma in Jane Austen’s romantic comedy Emma. The answer was Woodhouse. Congratulations to the two winners, who have been sent a hardback copy of our book Jane Austen’s England (the American version of Eavesdropping on Jane Austen’s England). To-morrow, in 3 vols. 12mo. price 1l. 1s. It was priced at one guinea, which was one pound and one shilling, a huge amount of money for most people – it seems strange that if you go into any cut-price bookstore today, you may find paperback copies of Emma at about the same price. 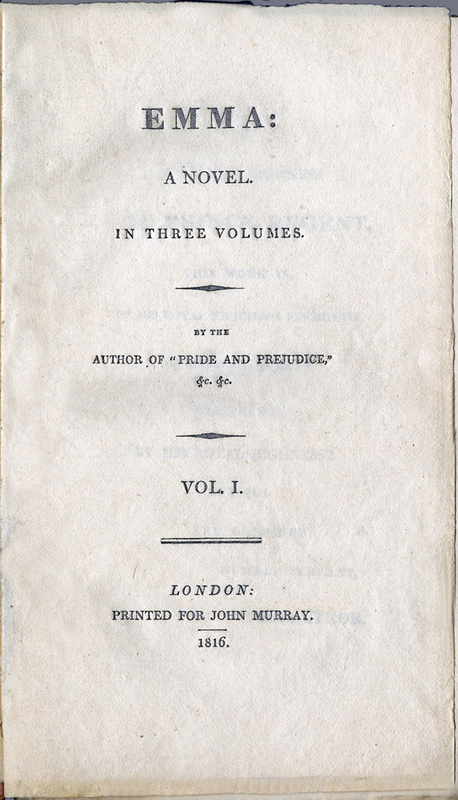 Although Emma was published two days before Christmas 2015, the title page had the date of 1816, and most copies would undoubtedly have been purchased that year. Emma covers many broad issues, including marriage, deception, misunderstandings, social status and medicine – Emma’s selfish father constantly fusses about his and everyone’s health. There are also small details that contribute to the humour, the plot and individual characters, such as when Emma and Harriet visit Miss Bates and her mother. Miss Bates talks at length about a short letter from her niece Jane Fairfax, even though, she says, Jane normally writes much more, using cross-writing. In fact, Mrs Bates often says to her: ‘Well, Hetty, now I think you will be put to it to make out all that checquer-work.’ Because the recipient normally paid to receive letters, extra sheets of paper increased the cost. Jane Austen’s readers would instantly understand that Jane Fairfax did not want to burden her aunt and grandmother with heavy postal costs, so she would write in two directions on the same sheet. Several mentions of letters and the postal service occur in Emma, and when Jane Fairfax moves to Highbury, one plot device is for her to fetch her own letters, as she needs to keep her correspondence private. Mrs Elton tries to interfere, as she thinks a daily walk is unhealthy. She is a social climber and boasts that she can find Jane a good position as a governess, because she mixes with such fine people. Indeed, she once knew a woman where ‘every body was anxious to be in her family, for she moves in the first circle. Wax-candles in the schoolroom! You may imagine how desirable!’ Wax candles were of course thought to be wasted on children and governesses, when cheaper tallow candles were sufficient. For more on the postal service and letter writing, see our newsletter 33 (for October 2013). The latest magazine article we have had published is ‘Joseph Ritson, Song Collector’ in Folklife Quarterly for January 2016, which talks about the 18th-century antiquarian and collector of early ballads and songs, Joseph Ritson. Check out the FQ website here. It’s good to talk – isn’t it? In days long past, while working as archaeologists in London and Surrey, we were regularly asked to give talks, sometimes as the main entertainment or as part of a programme of talks with several speakers. Rather than simply describe our discoveries, we had to illustrate them with 35mm slides, so there was a lot to prepare, especially if we had to take our own projector equipment, such as screen, projector, projector stand and extension leads. The talks were hosted mainly by local and county archaeology societies, most of whose members enjoyed archaeology as a hobby and quite often worked as volunteers on excavations. Because archaeologists were public servants (and therefore poorly paid! ), we were expected to give talks as part of the job, usually with no remuneration, but we did enjoy doing them. The most memorable one was to a packed hall somewhere in the City of London, and afterwards they took us off to an old pub, leading us down dark alleyways and pointing out parts of the city that we never knew existed. That was quite magical. Most people’s first efforts at public speaking are nerve-racking and not quite up to standard, and we were no exception. Over time, we hope that we showed improvement. We certainly became aware of the failings of other speakers and what errors to avoid. We also encountered a good number of poor organisers, who had perhaps been roped into the role of arranging a programme of talks for their society without realising what was involved. Keeping their members happy was more important than the welfare of individual speakers. The Council for British Archaeology agreed with our idea for a booklet to act as an aide-memoire for speakers and organisers to help raise standards, which they published in their ‘practical handbooks’ series as Talking Archaeology (ISBN 090678087X). If we were writing it today, we might not be so didactic and patronising – and yet everything really needed to be said. 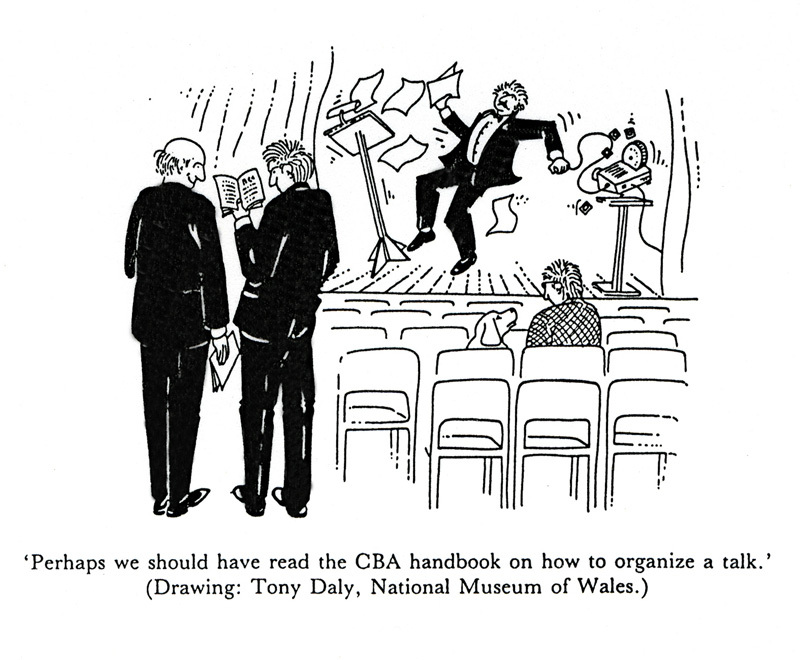 The booklet was 42 pages in length, and it was enlivened by ten wonderful cartoons by Bill Tidy. This brilliant cartoonist has over the years illustrated many Council for British Archaeology publications, but he is best known for cartoon strips such as ‘The Fosdyke Saga’ that ran in the Daily Mirror. His autobiography is well worth reading. Published in 1995, it is called Is There Any News of the Iceberg? An Illustrated Autobiography. Once Talking Archaeology was published, we were not asked to give any talks for a few years. This may be a coincidence or was possibly because we had by then moved away from London. The handbook has been out-of-print for a few years now, and we suspect it had no effect on the performance of speakers or the organisation of lecture programmes within societies. Sorting through paperwork recently, we came across a review by Richard J. Brewer in volume 25 of the journal Post-Medieval Archaeology. This is the only review we have ever had that was illustrated with a cartoon. It was drawn by Tom Daly of the National Museum of Wales and is reproduced here, showing an audience of one man and his dog, a hapless speaker causing chaos and two organisers consulting our book. 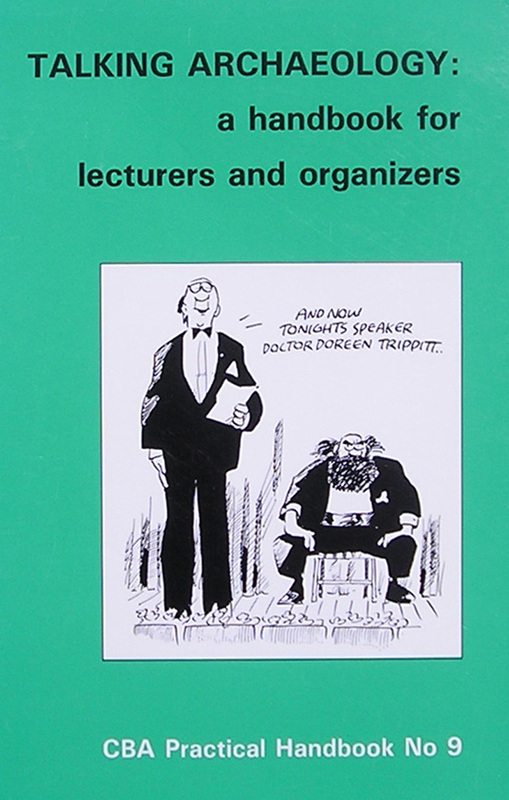 The cartoon reflected Richard Brewer’s own experience of being at a seminar that was scheduled to last two hours but came to a halt after 25 minutes – and in that short time the speaker managed to knock over the lectern, scattering his notes, and also bring the projector tumbling to the floor. Nowadays, we mainly give talks that are connected to the themes of our books. Most of these talks are to literary festivals, libraries and bookstores, but we always consider other venues. As we are busy writing, it is likely that the only talks we will do in 2016 are the ones given here. Two of them are in our own local area of Exeter in Devon. One talk is ‘Eavesdropping on Jane Austen’s England’ for the U3A on Thursday 27th October at the Mint Methodist Church, Fore Street, Exeter, EX4 3AT at 10am (the talk starts at 11am). You will need to be part of this organisation to attend, but this gives you plenty of notice. Before that one, we are giving two other talks on ‘Jack Tar: Life in Nelson’s Navy’. The first one is on Monday 25th April at the village hall in Whitestone, near Exeter (address: Merrymeet, Whitestone, EX4 2JS), starting around 7.30pm, free for the social club members, £2 for guests. The other talk is on Wednesday 18th May at the library in Denmark Street, Wokingham, Berkshire, RG40 2BB, at 2.30pm. A large car park is close by. Tickets will be available nearer the time from the library.